Hallstatt is widely considered one of the most beautiful places to visit in Austria, however it’s not easy to avoid the other tourists. Ever since the moment that I saw a photo of Hallstatt as a teenager, I wanted to visit this fairytale Austrian village. Keep reading for the best things to do in Hallstatt, Austria if you have one day, tips for visiting Hallstatt, what not to do in Hallstatt, and tips for getting to Hallstatt independently. I was actually a bit nervous about visiting Hallstatt (and writing about it!) as I read about overtourism in Hallstatt, a beautiful UNESCO recognized world heritage site recognized for its stunning architecture and well-maintained landscape. Salt production has been key for the community since the Bronze Age. The wealth from the salt mines allowed the formerly timbered city to be rebuilt in the late 1700s. There’s no denying that Hallstatt is touristic at this point. Over 600,000 people visit Hallstatt, a small town of only 750 residents. I ended up doing some research about the impact of overtourism on this small town. 80% of the residents work in the tourism industry, which is good as it’s providing paychecks to the locals. That said, I recommend avoiding the tour bus to Hallstatt, if you can, and going independently, which is easy enough as a day trip from Salzburg. Annoying groups on group tours rank among the complaints that many people (even tourists) have about Hallstatt. The streets are narrow and it’s hard to walk with a large group. Looking for somewhere less touristy? Head to Sankt Gilgen! Be sure to get to Hallstatt early. Most day trips from Hallstatt by bus depart from Salzburg or Vienna in the morning, so expect crowds arriving between 11am and 1pm. By the time that the late afternoon hits, you’ll lose many of the crowds who intend to head back in time for supper. If you want to avoid the crowds, arrive as early as you can and consider booking a room in Hallstatt to enjoy the stunning town with its adorable wooden houses! If possible, avoid peak season, which is mostly in the summer as well as September with a slight peak around the holidays in January. I visited at the beginning of peak season and it wasn’t as bad as we arrived early enough to peak the crowds. For those who can’t avoid the crowds otherwise, try to get to the elevated upper level of the town. Most tour groups who are just stopping off briefly in Hallstatt stay in the main square with a brief detour beyond the church. Once you get beyond the church, it feels like a different town as it’s so much quieter. To be fair, there’s not that many hotels in Hallstatt itself. If you’re early in booking your hotel, consider staying at the family-run Seewirt Zaune hotel, which sits right on the main square of Hallstatt. To save some money, we ended up staying just across the lake in Obertraun at Seehotel am Hallstätter See. The view of our hotel, which was less than 150 euros per night in peak season, included a stunning view of the mountains as well as the water. It was an easy and scenic drive from Hallstatt. Check hotel rates in Hallstatt now! 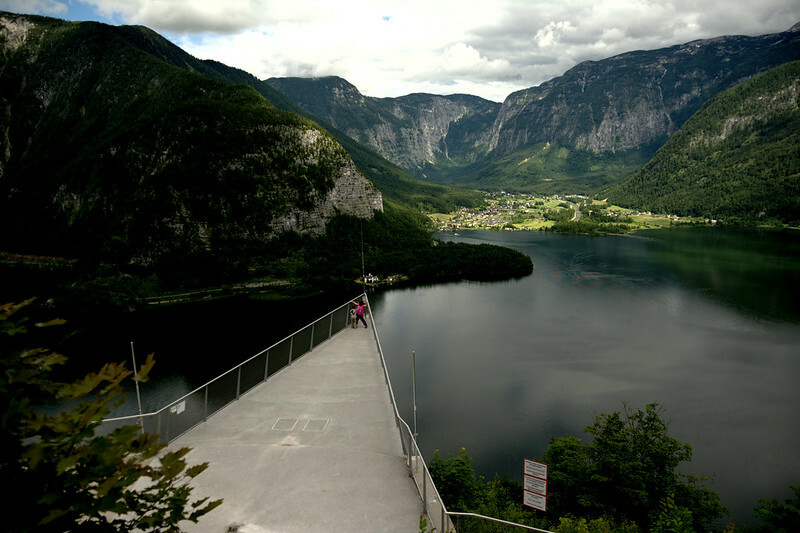 Many tourist don’t know about the stunning viewing platform that is just outside of Hallstatt. If you look up Badestrand Hallstatt/Lahn, this bit for swimming has stunning views of the mountains surround Hallstatt as well as the town itself. If you bring your swimsuit and the weather is good, you can jump in! I do recommend having a camera with a good zoom as the town is still about a twenty minute walk and far enough that it might be harder to get a good photo. I still loved the 270 degree view! If you’re lucky, you’ll see the traditional boats going along the lake as I did. Many people overlook the Beinhaus (Bone House) in Hallstatt, however the ossuary here is a great testament to the cultural heritage of this community. Due to overcrowding in the small cemetery, there is a waiting list and a limited number of graves. Traditionally, bodies of the deceased have been exhumed with their skulls painted with beautiful designs in order to give a little insight into their lives. It’s important to note here that when funerals as well as other major Catholic holidays occur, tourists are prohibited from taking photos and/or to stay away from any mourners. That seems like common sense, however the Hallstatt community has needed to hire bouncers for the church as tourists have been incredibly inconsiderate to those in the community. The Parish Church in Hallstatt dates back to the 12th century although it took another 300+ years to complete the difficult construction. Over time, some of the designs were adapted into the Gothic style, in particular the altar. The church was not just for the elite, but also the commoners. The altar is beautiful to view and it’s important to remember that this is a church still in active use. The stunning marketplace of Hallstatt is typically one of the most crowded parts of this stunning village in Austria. I first was worried that visiting the village center would be too…touristy, but it’s just as picture perfect as you might imagine. Here, you’ll find many of the late Gothic houses that define the city’s iconic architecture. If you’re coming here to fulfill your childhood fantasies, I strongly recommend getting a scoop of ice cream and sitting on the benches. Despite the crowds, viewing the historic center of Hallstatt is still one of the best things to do in Hallstatt. To be honest, we didn’t end up renting some of the swan boats as they’re quite expensive and you can get a lovely view from one of the many cafes along the water. Many people rave about the view, but if you’re visiting Hallstatt on a budget, you’ll want to skip this unless you’re keen on escaping the crowds. As you might imagine, prices are elevated in Hallstatt, so come ready to drop some cash on food if you intend to have lunch or dinner in Hallstatt. Prices were 1.5-2x what you’d normally pay. After looking through a few menus, I was still able to have a great Austrian meal with an incredible view along the lake. For some inspiration on some delicious dishes to try in Austrian, head over to this blog about Austrian food. The salt mines in Hallstatt are considered to be some of the oldest in the world, dating back over 7,000 years. The historic significance of these salt mines are the reason why Hallstatt has UNESCO recognized status and it’s worth the excursion if you have the time. Just be warned that tickets are best reserved in advance–and you should plan your day in Hallstatt carefully to go to the salt mines first. Similarly, the skywalk above Hallstatt offers stunning views over the mountains. Tickets for the skywalk must also be purchased in advance (best at the beginning of the day) as they sell out quickly. Unlike the salt caves, you aren’t required to have specific kinds of footwear to enjoy the view from above. As with the salt mines, it’s best to come here in the morning as the cable car ends fairly early, around 16:30 in peak season. Just be warned that this 350 meter high platform costs a pretty penny: 16 euro per adult. What not to do in Hallstatt: How not to be an a**hole. With so many tourists visiting Hallstatt, you can imagine that they’ve seen their fair share of bad behavior. I was lucky enough to visit with an Austrian friend who has been before, so I hope that this helps you make a better impression on the locals. This even bothered me. I have no problem with selfie sticks more generally, however I have a problem with it when you’re walking down a narrow path without looking where you’re going while holding a selfie stick. I was almost whacked numerous times by people too busy worrying about their pictures/videos to think about others around them. Simply, there are some great photo spots: put your selfie stick away until you get there! Austria has some of the strictest drone laws in Europe. You cannot fly near people or in cities, so be sure to leave your drone in the car if you’re visiting Hallstatt. You’re likely to make friends with the local police if you decide to fly as it’s illegal. There are signs prohibiting drones all around Hallstatt. Fun fact: you can get an awesome drone-free free view by climbing the stairs towards the cemetery and looking down. If you take the ferry over to Hallstatt, you’ll also get a great view! This is the big one. While in Hallstatt, I saw several tourists trying to get in front of some of the picturesque timber houses to take a photo, however people live inside of these houses. Many residents have put up signs in a multitude of languages reminding people that people actually live there, however I saw at least one tourist trespassing for a better photo. Don’t be that person and make sure that the locals are ready to welcome tourists into their community. This is what annoys my friend. Although people who work in the shops certainly speak some English, Austrians appreciate that you’re trying to learn about their language and culture. Even if you’re not a skilled linguist, try with German. At least throw in a polite bitte (please) or danke (thank you) or Die Rechnung, bitte! (the bill please) or tschüss (goodbye) as you leave. If you’re feeling fancy, throw in Ich möchte… (I would like…) prior to ordering. This is a big one. People live in Hallstatt and finding trash on the ground isn’t nice for anyone no matter where they live. I saw plenty of rubbish bins all around Hallstatt, so please save your garbage for where it belongs. We drove to Hallstatt, however cars are not allowed into the city center during the day time. This is the case, even if you have a hotel. We parked in the large multi-story garage that is open year-round (P1). Just follow the signs. It’s about a fifteen minute walk into town. If you intend to take the train to Hallstatt, it will take about three hours to make the journey on train from Salzburg to Hallstatt. You’ll need to transfer at Attnang-Puchheim prior to heading to Hallstatt. However, it isn’t that simple. The best part of your journey will be the ferry ride from the Hallstatt train station across to the village of Hallstatt itself. This is the prime moment to snap your photos, so be sure to bring a good camera with you if you’re intending to take the ferry. Note: you can also take a bus to Bad Ischl, a lovely spa town that I’ll be writing about soon, prior to taking the train towards Hallstatt. I understand that not everyone has the time to plan travel in detail and that’s why tour buses exist. Hallstatt is easiest as a day trip from Salzburg with a tour company although it’s also possible to visit Hallstatt (along with a few other attractions) as a day trip from Vienna. Have you been to Hallstatt, Austria? We did a day trip here about 5 years ago. We were staying in Tandern outside of Munich. We drove ourselves, and had a wonderful visit & then headed to Salzburg before going back to our apartment in Tandern. This was one of our favorite days of the 16 we spent in Germany/Austria & Italy. We would all go back here in a heartbeat!